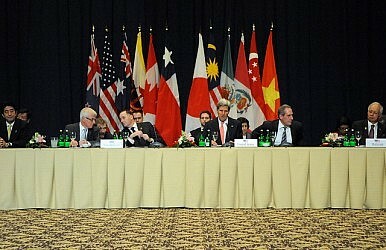 With Fast-Track in Place, Can a TPP Deal Be Struck? The recent TPA bill was a major step forward, but some tough negotiations remain. There’s new momentum to the Trans-Pacific Partnership (TPP) negotiations with U.S. President Barack Obama signing the Trade Promotion Authority (TPA) bill into law after approval by the Senate. Other TPP countries can now proceed with negotiations confident that any final agreement will face a more streamlined ratification process in the United States. A TPP deal across the 12 nations that are part of the negotiation process now appears within reach, although challenges certainly remain. Among residents of the TPP countries, public support for the TPP appears to be relatively solid. The Spring 2015 Global Attitudes Survey published in June by Pew Research, surveying roughly 1,000 residents in each country, found that public support for the TPP was especially strong in Vietnam (89 percent), Peru (70 percent), Chile (67 percent), and Mexico (61 percent). Public support amounted to approximately 50 percent in Japan, Australia, Canada, and the U.S., with 24 percent against in Japan and roughly 30 percent against in the other three countries. Support for the deal was weakest in Malaysia at 38 percent, with 18 percent against. Despite the general support for the deal among the public, further works remains to be done in the actual negotiations. Malaysia’s primary sensitivity relates to its policy of providing preferential treatment for ethnic Malays, known as Bumiputera. Domestic companies, for example, must reserve 30 percent of equity for Bumiputera investors, while foreign corporations have to set aside 12.5 percent for all new listings. According to Dr. Shankaran Nambiar, a Senior Research Fellow at the Malaysian Institute of Economic Research (MIER), “The Malaysian government will seek to convince the other members that due recognition must be given for it to pursue the preferential treatment of the Bumiputera and Bumiputera participation in business. This is an issue that permeates other chapters such as government procurement and state-owned enterprises.” On the other hand, the U.S. has its own challenges with its “Buy American” provisions. Canada is one of the countries challenging the U.S. on this provision. Vietnam views itself as an economy in transition and wants some flexibility in any agreement. During the meeting between Prime Minister Nguyen Tan Dung and U.S. Trade Representative Michael Froman on April 22, Dung reportedly raised the issue of Vietnam’s development in relation to its negotiating partners. Vietnam’s low wage environment gives it a particular advantage in labor-intensive industries such as apparel and footwear, which are a concern for other TPP countries. As the national delegations seek to reach final agreement, TPP countries are also considering ratification issues. “Fast-track” authority has largely cleared the way to ratification in the U.S., with Congress being given an up-or-down vote on the entire agreement without the opportunity to make any specific amendments. In Australia, ratification would involve securing support from the opposition Labor Party, since the government does not currently have a majority in Australia’s Senate. Three countries where ratification is assumed to be relatively straightforward are Singapore, Brunei, and Vietnam. According to Ambassador Barry Desker, a past head of Singapore’s Institute of Defence and Strategic Studies, “Singapore regards the TPP as a ‘state of the art’ agreement on intellectual property, services and government procurement. Unlike the U.S., the process of ratification is less contentious in Singapore. Ratification is a decision of the Cabinet and would not require parliamentary approval.” In the monarchy of Brunei, a trade agreement is likely to be passed easily if the Sultan sees it as being in Brunei’s best interests. In Vietnam, a one-party communist state, passage of the TPP, once recommended by the prime minister, should be endorsed by the 498 representatives of the national assembly. Although TPP negotiations are in the home stretch, some key issues require hard decisions by respective governments and some major ratification issues will need to be resolved before a final agreement can be reached and implemented. Shom Sen was the 2014 Jack Wadsworth Fellow at the Asia Society. The views expressed are his own. Secretary of Commerce Pritzker’s trade mission to Japan this week underscores the progress made in recent years.